Did you know that February the 14th, Valentine’s day is a day that not only represents love, romance and the celebration of the relationship between man and woman, man and man, woman and woman, but it is also a day that remembers Saint Valentinius ( Valentine), officially known as saint Valentine of Rome, a saint who performed weddings for soldiers who were forbidden to marry and for ministering to christians who were persecuted under the Roman empire. 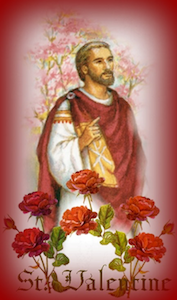 Legend tells us that Saint valentine of Rome was imprisoned and during this imprisonment he healed the young daughter of the man who put him in jail, Asterius. Before his execution he wrote a letter to his jailer’s daughter and signed it ‘Your Valentine’ as a farewell to her. And so valentine’s day is created, we celebrate and honor the death of Saint Valentine of Rome, but also celebrate the love and relationships we have in honor of a man who went against the law of the Roman empire in the name of love and romance. An amazing history lesson, and a an amazing man who went above and beyond for what he believed in­ which was love and romance, to see people happy together in life. What is the importance of valentine’s to you? what does it mean to you? It is a time to appreciate the love within life, to appreciate the love you have with your partner, it is a day to give thanks for the love in your life, perhaps through words of I love you, or through the gift of a rose picked from the garden, It is important we acknowledge the love in our lives and use this day as a reminder and a day of appreciation as to how lucky we are. in the past they don’t so much need it again if they don’t want it as love always remains within you, that for those of you searching for love, to remind you that love is out there, and for those of you who have love to help you see and feel the great essence of the love within your relationship, for those who don’t believe in love this one day february the 14th is said to make even those people have new faith in love even for a day. the opportunity to live a life of happiness, love and romance, this is what Valentinius did and this is what I shall always remember on Valentines day, perhaps take some time on your Valentines day to remember Saint Valentine of Rome, you never know he may just be listening to you, and for those of you who are searching for love he may just send a new love your way….